The pea aphid (Acyrthosiphon pisum Harris) was introduced into North America along with the legume crops it attacks: pea, lentil, alfalfa, clover. It is now present throughout the continent in most places where these crops are grown. It can also be found infesting some leguminous weeds. The wingless form is large and green, in our region, similar in color to the pea plant, and noticeably long-legged, compared with other aphids. The cornicles (tail-pipe-like structures on the rear of the abdomen) are long slender tubes and are unique to the aphid family (Aphididae). Two other related and similar species, A. kondoi and A. lactucae also occur in the American West, but are not typically found on pea or lentil. A useful site to help with identification can be found at UCIPM (The University of California Statewide Integrated Pest Management website). The pea aphid injures the plant directly by removing sap with its sucking mouthparts. Sufficient numbers of aphids can cause wilting, distortion of leaves, stunting or killing the host plant. When infestations are large, the whitish cast 'skins' or exuviae can be observed covering the plant. Numbers of aphids capable of causing injury to the crop have been estimated as a basis for decisions about when to control them (see Managing The Pea Aphid). Management of the aphid is complicated because it is a vector of several important and injurious viruses affecting pea and lentil. BLRV is a spherical virus infecting many legumes. BLRV is not transmitted from plant to plant mechanically, i.e. through plant sap. It is transmitted only by aphids, the main vector being pea aphid (Acyrthosiphon pisum). BLRV is transmitted by aphids in a persistent manner, which means the virus requires several hours of a minimum acquisition access period, substantial latent period, and several hours of a minimum access inoculation period. Because of this, BLRV infection can be prevented or limited through a timely application of insecticides. Once acquired by the aphid, BLRV persists for the life of the insect. In susceptible varieties of pea (Pisum sativum) BLRV causes stunting, chlorosis of the youngest leaves and sometimes downward leaf-rolling. BLRV also causes stunting and yellowing of French bean (Phaseolus vulgaris), chickpea (Cicer arietinum), and lentil (Lens esculenta). Infection in the major perennial hosts, alfalfa (Medicago sativa) and white clover (Trifolium repens), is usually symptomless. PeSV is a long filamentous virus infecting legumes. The virus is easily transmitted mechanically through plant sap. PeSV is transmitted by the pea aphid (Acyrthosiphon pisum) in a non-persistent manner, after a minimum access acquisition period of 15 min. There is no latent period for PeSV transmission, and infectious virus is retained by the aphid for only a short period of time, less than 1 hour. PEMV is a small, spherical virus which infects legumes. PEMV can be transmitted mechanically, through plant sap, however in nature it is transmitted in a persistent manner by at least 10 aphids of which pea aphid (A. pisum) and green peach aphid (M. persicae) are the most important. Minimum acquisition access period in nymphs is only 15 min, and in adults - 2 hours. PEMV has a temperature-dependent latency of 4-70 hours , followed by a minimum access inoculation period of 7-120 seconds. Because of this persistent mode of transmission, PEMV can be controlled through insecticide applications. 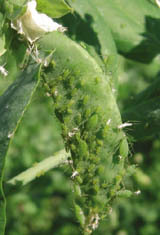 Once acquired, the virus persists in the aphid body for the life of the insect and is retained through moulting, although it is not transmitted to progeny, and does not multiply in aphids. Infected pea (Pisum sativum L.) plants develop a slight downward rolling of the trifoliate leaves 4-6 days postinoculation followed by a distinct yellow mosaic on the leaves. The yellow mosaic spots become translucent and clearly delineated. Later, plants develop growth malformation, stunting, and sometimes a top necrosis resulting in the loss of apical dominance. Late in infection, diagnostic blisters or enations (hyperplastic outgrowths perpendicular to the leaf plane and associated with the veins) may develop on the underside of the leaves. Pods are often malformed and warty looking, and contain few if any seeds. Numerous natural enemies of the pea aphid are known from commercial dry peas and green peas in the Pacific Northwest, including Coccinellidae (Coleoptera), Carabidae (Coleoptera), Staphylinidae (Coleoptera), Anthocoridae (Hemiptera), Nabidae (Hemiptera), Reduviidae (Hempitera), Geocoridae (Hemiptera), Syrphidae (Diptera), Chrysopidae (Neuroptera), Ichneumonidae (Hymenoptera) and Braconidae (Hymenoptera) (Snyder and Ives 2003). Coccinellids are ferocious predators both as larvae and adults. They can consume numerous aphid nymphs and adults per day (Dixon 1998). Carabids & Staphylinids are predators as both larvae and adults. Anthocorids, Nabids, Reduviids and Geocorids are predators as both nymphs and adults; all four families use modified piercing-sucking mouthparts to feed on the haemolymph of aphids after piercing through the cuticle. Syrphids and chrysopids are only predators during their larval stages. Ichneumonids and braconids are parasitoids that lay eggs inside their aphid host with their modified ovipositor. Parasitoid larva(e) feed on the nutritious haemolymph eventually killing the aphid. Ichneumonids and braconids (Braconidae) pupate and emerge as adults from the aphid. The pea aphid has several defensive mechanisms to stall or inhibit natural enemy foraging. These mechanisms include walking away, kicking with hind legs, synchronized twitching, and the excretion of an alarm pheromone (Franke et al. 2008). The volatile alarm pheromone, (E)-beta-farnesene, is secreted from the cornicles as a warning to other aphids that a parasitoid or predator is nearby (Mondor et al. 2000). Pea plants with reduced surface waxes have been shown to harbor fewer aphids, while enhancing the total abundance of natural enemies (Chang et al. 2006). Pea aphid cannot overwinter in the higher elevations of the Palouse region, so it must colonize the region each season, almost certainly arriving with westerly winds beginning in May, before our legume crops have emerged. This rain of aphids continues until crops emergence after which they begin colonizing. The timing of this immigration and the abundance of aphids influences the risk of outbreaks each season. Based on our studies, a proportion of these aphids arrives already carrying BLRV, PEMV and possibly PeSV. Since these viruses are not seedborne and since the virus reservoirs in the Palouse are not known, these colonizing aphids bring the viruses that can eventually cause serious injury, an event that has occurred sporadically over the past nearly three decades. Chang, Gary C., Jeffrey Neufield, and Sanford Eigenbrode. 2006. Leaf Wax and Plant Morphology of Peas Influence Insect Density. Entomologia Experimentalis et Applicata. 119:197-205. Dixon, A. F. G. Aphid Ecology. New York, New York: Chapman & Hall. 1998. Franke, Devon L., Jason P. Harmon, Chad T. Harvey, and Anthony R. Ives. 2008. 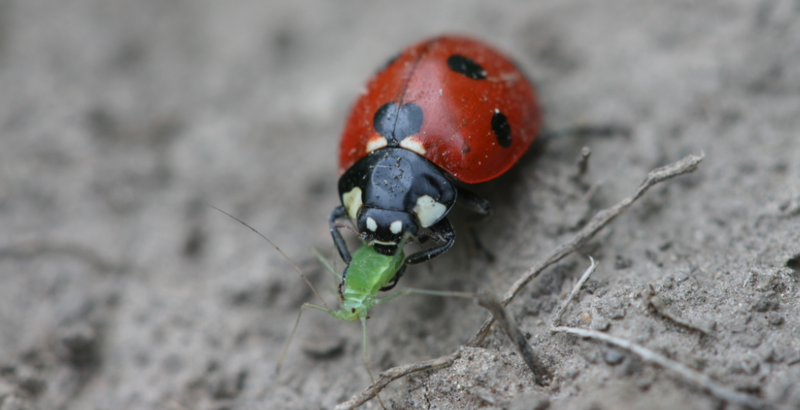 Pea aphid dropping behavior diminishes foraging efficiency of a predatory ladybeetle. Entomologia Experimentalis et Applicata 127:118-124. Mondor, Edward B., Scott D. Baird, K. N. Slesson, and B. D. Roitberg. 2000. Ontogeny of alarm pheromone secretion in pea aphid, Acyrthosiphon pisum. J. Chem. Ecology. 26 (12):2875-2882. Snyder, William E., and Anthony R. Ives. 2003. Interactions Between Specialist and Generalist Natural Enemies: Parasitoids, Predators, and Pea Aphid Biocontrol. Ecology. 84(1):91-107. 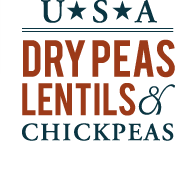 Funded over the years by USDA NIFA Risk Avoidance and Mitigation Program (RAMP) and the Cool Season Food Legume (CSFL) program, Regional Approaches to Climate Change (REACCH), and the USA Dry Pea & Lentil Council. Current funding is through the USDA Extension Integrated Pest Management (EIPM) Program. © 2018, EPPN, University of Idaho. All Rights Reserved.